When the first printed images appeared in Europe in the fifteenth century they were limited to the small size and shape of a sheet of paper that could fit in a standard printing press. By the sixteenth century, the ambition to rival paintings and to adorn wall surfaces prompted artists and printmakers to challenge these restrictions. Printed images were expanded in various ways to accommodate new formats. Large-scale woodcuts and engravings began to be printed on several sheets of paper that could be joined together to form a single picture. Some were arranged in frieze-like sequences similar to carved wall reliefs, while others were pieced together to emulate the scale of monumental murals and tapestries. 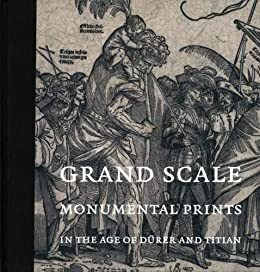 Grand Scale: Monumental Prints in the Age of Dürer and Titian, on view at the Philadelphia Museum of Art from January 31 – April 26, 2009, traced the rich history of an under-recognized aspect of Renaissance printmaking. This major loan exhibition featured a diverse group of nearly 50 rarely displayed prints dating from the late 15th to the early 17th century that are all uncommonly large in scale. They are printed from two or more woodblocks or engraving plates on multiple sheets that had to be joined together to form a single large picture. Drawn entirely from collections in the United States, Grand Scale was the first exhibition since the 1970s to explore this facet of printmaking with examples by some of the most important artists and printmakers of their day, including Albrecht Dürer (1471-1528) and Titian (c.1488-1576). Six of the works on view belonged to the Museum’s distinguished collection of old master prints. Printmaking flourished as an art form in the sixteenth century with the introduction of etching and other technological advances. Painters and artists working in other mediums became increasingly involved in print projects and undoubtedly contributed to innovative approaches to scale. The subjects of oversize prints range widely from the imperial processions of the ancient Romans to the ceremonial grandeur that surrounded the Hapsburg Holy Roman Emperor, Maximilian I (1459-1519); from the intrigues of Greek gods to the rowdy behavior of peasants in Reformation Germany; and from familiar biblical narratives to the nascent sciences of astronomy, warfare, and geography. 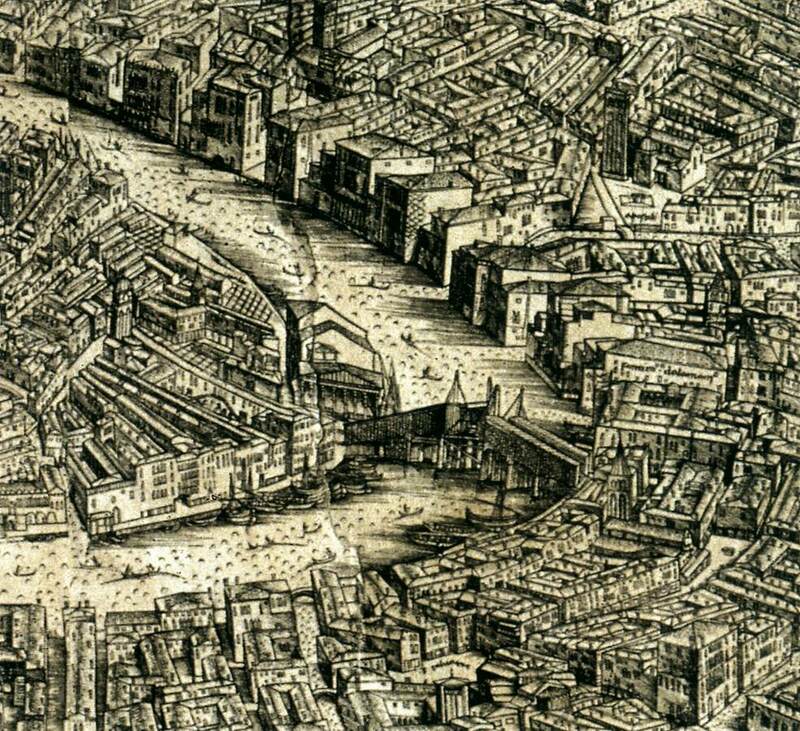 Jacopo de Barbari’s six-block woodcut, Map of Venice, 1500. This woodcut is remarkable in all its aspects: its high viewpoint, its perspectival rendering of the city in minute – if not completely accurate — detail, as well as its enormous size (approximately four by nine feet). The delicately carved woodcut lines can be fully appreciated in the extraordinarily fine impression loaned to the exhibition by the Cleveland Museum of Art. This was among the prints that paved the way for some of the most impressive mural-sized woodcuts produced by the workshop of the Venetian painter Titian over a decade later. printed from twelve blocks and measuring four by seven feet, was one of several works based on Titian’s designs featured in the exhibition. and Jan Saenredam’s The Punishment of Niobe, 1594.
is based on drawings for tapestries made by the artist when he traveled to Istanbul in 1533. The tapestries were never executed, but the designs survive in this woodcut frieze of seven scenes that constitutes an important early document of Turkish culture based on direct observation. an elaborate architectural design inspired by the triumphal arches of ancient Rome, on view in the exhibition. The Triumphal Arch is comprised of nearly 200 separate woodcut images and measures over 11 feet high – a complex visual tableau achieved as a collaborative project by artists in the service of Maximilian I, who reigned over much of Europe as emperor of the Holy Roman Empire from 1508-19. Albrecht Dürer oversaw the production of the woodcut blocks, which were executed by various artists in his circle. Overwhelming in its architectural scale and highly detailed in its individual scenes, the Triumphal Arch fulfilled its intended purpose, which was to celebrate the illustrious ancestry and achievements of the Hapsburg emperor. The survival of these monumental prints is remarkable in itself. Most were far too large to be preserved in collector’s albums, while others that were attached to walls as decorations, or rolled up and stored in cupboards, simply disappeared over time. Because of the challenges in displaying such large works, the rare impressions that have remained intact often languish unassembled in storage. Grand Scale offers a unique opportunity for visitors to experience firsthand an important, yet little-known facet of Renaissance art. Grand Scale: Monumental Prints in the Age of Dürer and Titian was conceived and guest-curated by Larry Silver, Farquhar Professor of Art History at the University of Pennsylvania, in collaboration with Elizabeth Wyckoff, Assistant Director and Curator of Prints and Drawings, Davis Museum and Cultural Center. At the Philadelphia Museum of Art, Shelley Langdale, Associate Curator of Prints and Drawings coordinated the exhibition. A fully illustrated catalogue, with essays by leading scholars in the field, and featuring 62 b/w and 45 color illustrations, accompanied the exhibition.